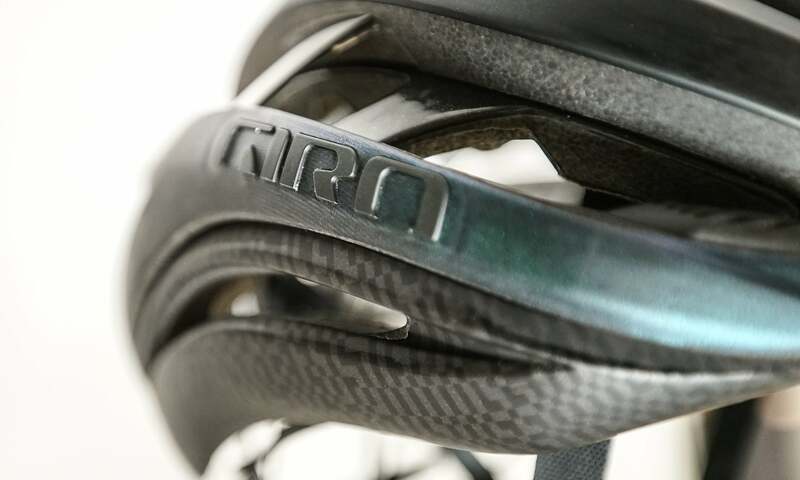 Giro Aether MIPS: Slip Plane Beauty With new MIPS Spherical, Giro puts MIPS at the core of its new helmet. When Team BMC Racing rolls out for the Tour de France on Saturday, July 7th, with the hope of putting Richie Porte in yellow, they will be wearing the new Giro Aether MIPS. On your TV screen it’s going to look like an updated Synthe – a little lighter, a little more aero, new lines, some fancy new marketing terms. What’s to get excited about, right? But wait, the usual incremental improvements we’ve been trained to believe are groundbreaking are really the least exciting things about this helmet. What is special about Aether is its reimagining of MIPS technology. 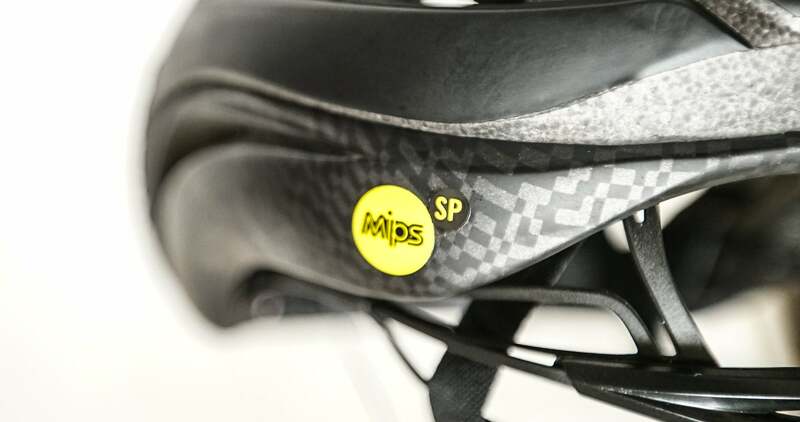 No longer an after-thought added to existing helmets, or even a helmet designed natively around the ubiquitous plastic ‘slip plane’ liner, the Aether MIPS puts MIPS at its core, literally. There is no plastic liner in the Aether MIPS, and at first glance, if you don’t catch the bright yellow MIPS dot on its shell, it appears to be a non-MIPS helmet. Unlike Giro’s other MIPS helmets which either feature a MIPS liner in an existing design, or a MIPS liner integrated into the helmet’s fit system, the Aether debuts MIPS Spherical – a beautiful, elegant and stealthy solution to fighting oblique impacts. 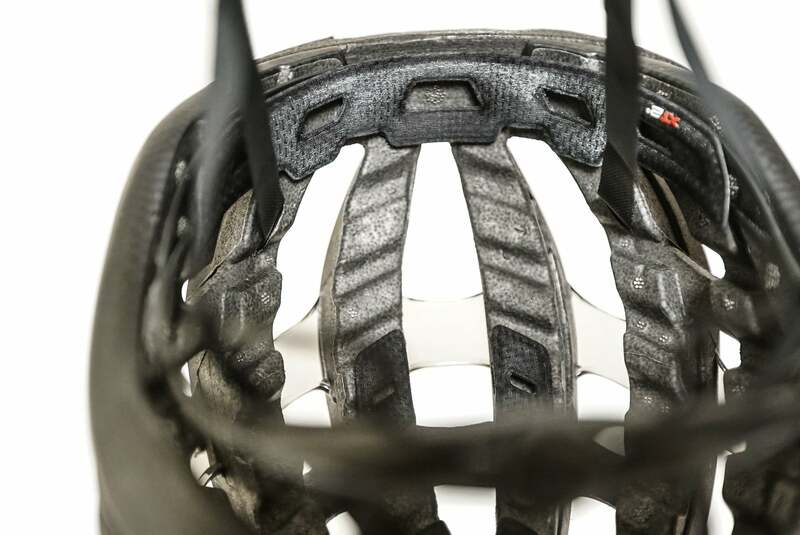 Using two independent EPS shells, with a friction reducing layer between, the Aether MIPS provides the critical 10-15mm of movement, in the critical 10-15 milliseconds after impact, to reduce the affects of rotational force on the brain, without the usual plastic liner. You need to get to a bike shop and hold it in your hands to truly appreciate it. Checkout this video to see how MIPS Spherical in motion. RELATED: Does MIPS Matter? Check out the newly minted helmet ratings from Virginia Tech, MIPS helmets dominated the results. We have a hard time imagining any other helmet brand could have produced this helmet. 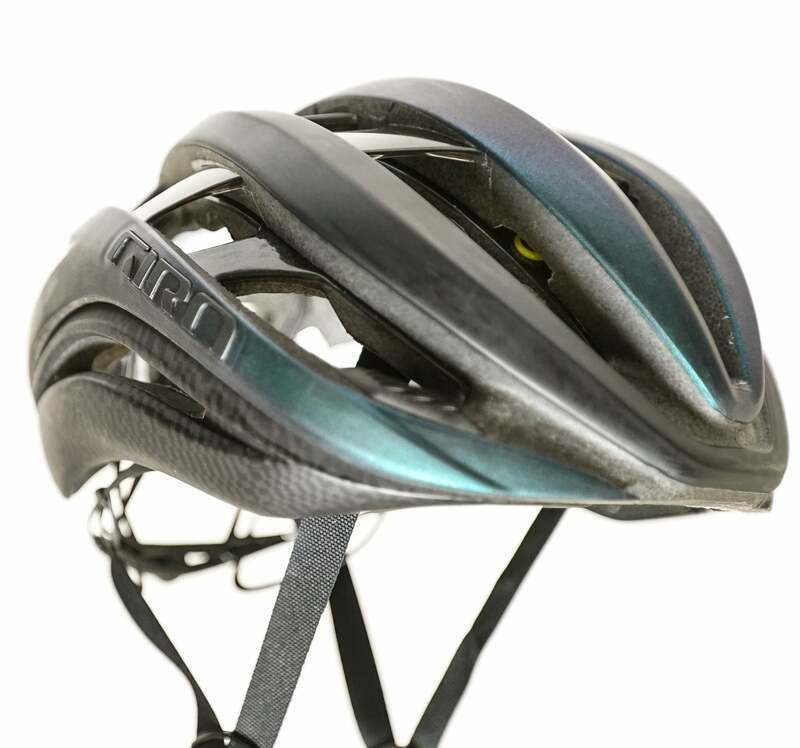 Giro, sharing facilities with its sister brand Bell, has 30 years of helmet experience, the most extensive testing facility in the industry – much of it designed to test rotational impact specifically – and amazing proficiency in producing dual density and dual shell helmets which we saw in the Bell Zephyr. The GIRO Synthe undergoing testing in one of the many test rigs at Giro’s facility. 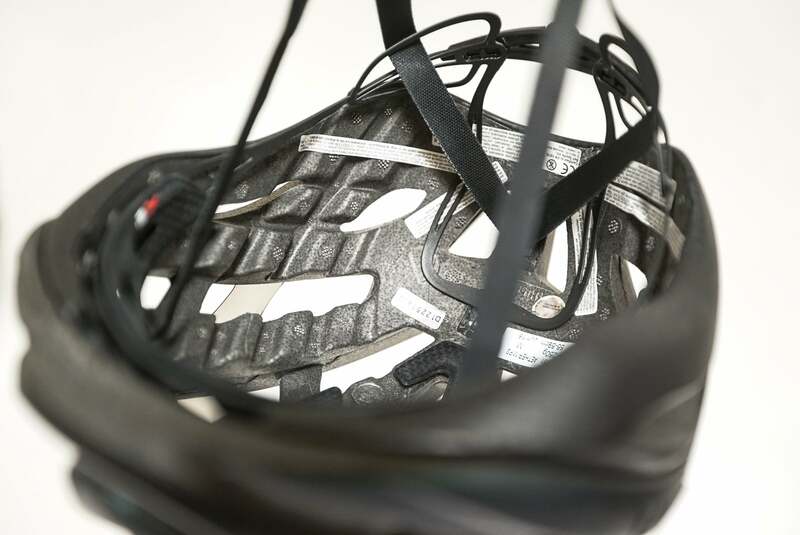 Giro’s production of helmets for other sports also played a huge role in the Aether’s development. While studying the impacts a slalom skier withstands from hitting gates, Giro realized they needed a helmet to withstand repeated low power impacts, yet still retain the ability to withstand a high velocity critical wipeout. It created the Avance, a dual density helmet with the very first MIPS Spherical design, but that was child’s play compared to Aether. The Avance is $600, heavy, large, and hidden under a carbon shell with almost no ventilation. 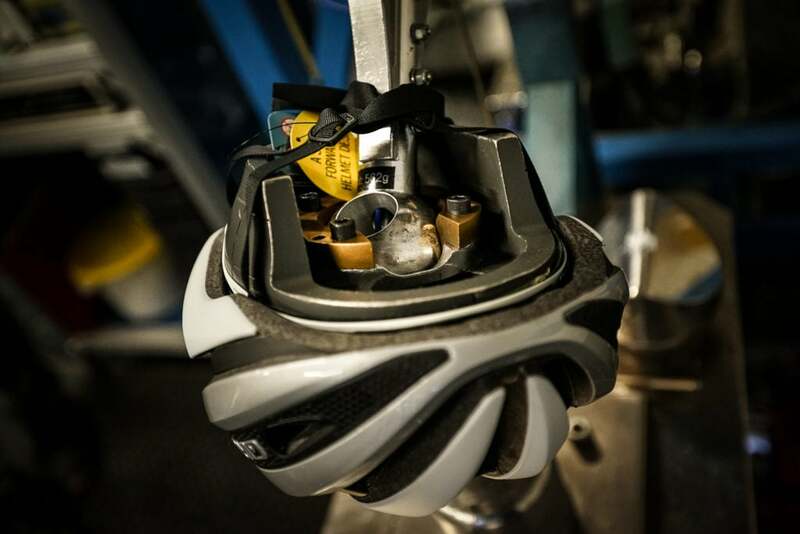 Putting MIPS Spherical in a helmet light enough, ventilated enough, comfortable enough and safe enough for the World Tour took three years and pushed the envelope of essentially every aspect of Giro’s core proficiencies. 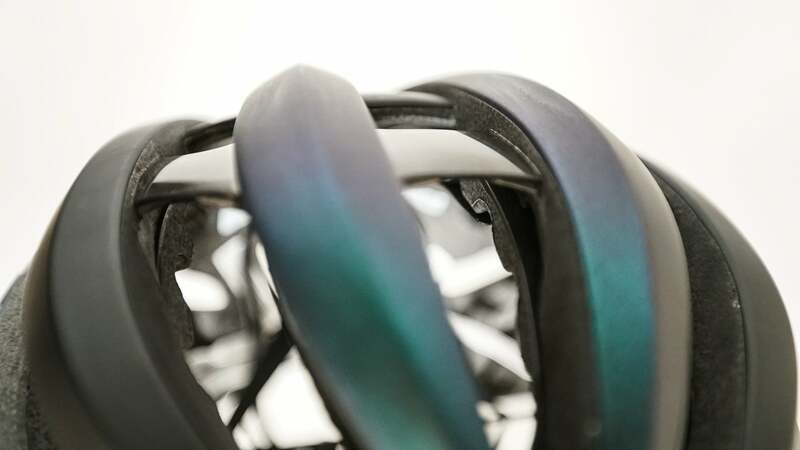 Aether is undoubtedly the most complex helmet Giro has ever made, but incredibly, that complexity is hidden in a simple, clean and elegant design. Aether is basically two helmets in one. The outside EPS shell is high density for high speed impacts, the internal EPS shell is lower density to handle slow speed impacts, and the shells move 10-15mm relative to each other to disperse oblique impacts – MIPS raison d’être – thanks to a friction reducing layer between. With the Giro Aether it feels like MIPS has finally come of age. No more squeaky plastic layer, no more Frankenstein retro fits. No more pro racers ripping out MIPS layers because they muddled up helmet fit. Shortly after MIPS debut, PELOTON got a call to check out the new MIPS helmets of a team which will remain nameless. We drove out to their hotel outside of Oudenaarde, Belgium. The team handed us one of the rider’s helmets, the spanking new MIPS layer had been pulled out. We asked for another rider’s helmet, the layer had been ripped out of that one too. Needless to say, we didn’t write a story about this new helmet. To put this in a lightweight, ventilated helmet required a six piece polycarbonate shell. It was not just time consuming and difficult to make, it pushed Giro to work with new materials. Instead of the manufacturing team telling the design team something wasn’t possible, they worked to find solutions. The best example of this commitment is the intricate shapes required by the dual shells and six polycarbonate outer shells. Manufacturing found EPS beads would not flow into the small spaces demanded by the design during molding. Instead of rejecting the design as impossible to make, they found dual density nano-bead EPS which would flow into the tighter spaces and provide the beautiful fit and finish the design demanded. When it came to passing the slew of drop tests required for CE CPSC certification, Giro was again pressed to find new solutions. It wanted huge vents with deep channeling, but the two shells required reinforcing that would not impact ventilation. The result is a polycarbonate bridge crossing the vents and providing structure for blunt impacts called the Aura Reinforcing Arch and cooling numbers better than the Synthe MIPS. 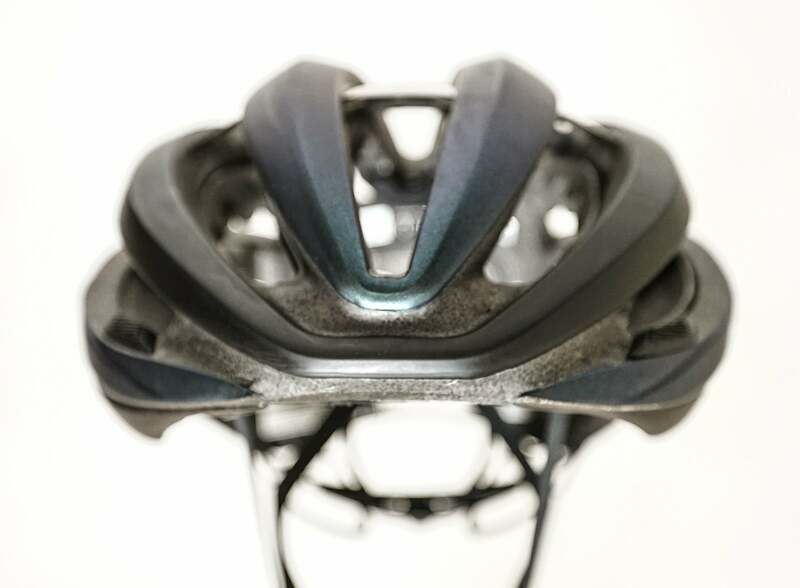 As if all this wasn’t enough the helmet has plenty of features that would actually make it a legitimate product update even without the innovative MIPS Spherical design. A new Roc Loc 5 retention system adds occipital contact adjustment to the usual dial and vertical fit tuning of the Roc Loc. Just to add extra complexity, because ‘Why not, right?’, the Giro logo is a single three dimensional piece pressed into laser cut opening from the back of the shell. Add integrated eyewear docks and the Aether has all the bells and whistles one could want in a 250 gram package. As for the ride, you’ll quickly forget about the Aether, and that is the point. 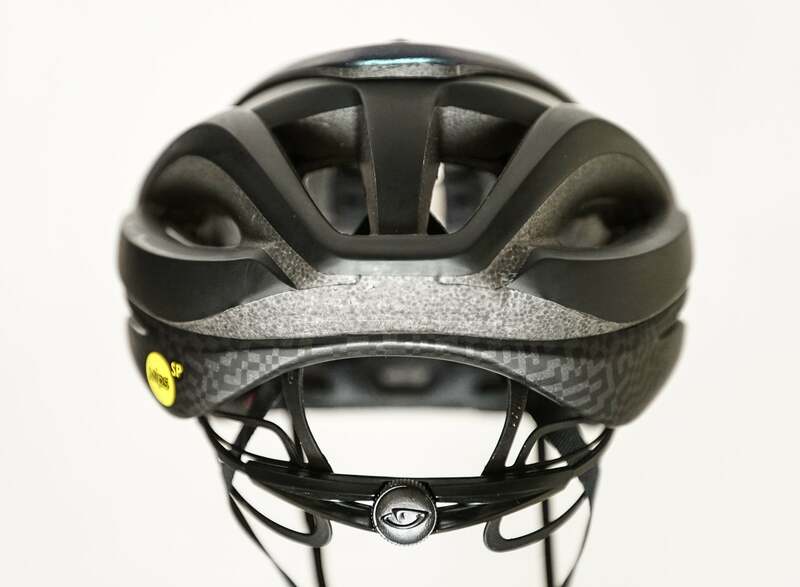 It has Giro’s usual head form, the fit system is incredibly comfortable but will adapt to more head shapes, it feels among the coolest and best ventilated helmets, at high and low speed, we have ever ridden. Giro says it’s plenty quick too, although they have not yet finished their aero testing so no comparisons have been made. The Aether is beautiful, its MIPS equipped, and it represents not just cutting edge tech, it’s an exquisite piece of design that gracefully adds protection for your most important asset. Go to the bike shop. Hold it in your hands. Admire the incredible fit and finish. Rock the internal shell back and forth against the external shell. Of course, only do that if you’re willing to spend $325, because you’ll want the new Aether to go home with you.